The International Center for Biosaline Agriculture (ICBA) is an international, non-profit agricultural research center established in 1999. The Center carries out research and development programs focused on improving agricultural productivity and sustainability in marginal and saline environments. Innovation is one of our core principles. We use a multi-pronged approach to addressing the closely-linked challenges of water, environment, income, and food security including research innovations in the assessment of natural resources, climate change adaptation, crop productivity and diversification, aquaculture and bio-energy , and policy analysis. The Center is working on a number of technology developments including the use of conventional and non-conventional water (such as saline, treated wastewater, industrial water, agricultural drainage, and seawater); land and water management technologies and remote sensing and modeling for climate change adaptation. 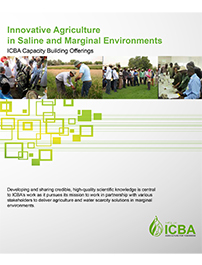 Improving the generation and dissemination of knowledge is an important strategic objective and we are focusing on developing ICBA as a knowledge hub on sustainable management and use of marginal resources for agricultural production in marginal and saline environments. With the help of its partners, ICBA innovates, builds human capital, and encourages the learning that is fundamental to change. ICBA’s work reaches many countries around the world, including the Gulf Cooperation Council countries, the Middle East and North Africa, Central Asia and the Caucasus, South and South East Asia, and sub-Saharan Africa.